Presto! BizCard Reader comes with a compact USB simplex scanner. Presto! BizCard is a comprehensive contact management system that helps you scan business cards, edit business cards, and then synchronize the contacts to various management applications. It is the ideal tool for staying in touch and organized no matter what languages your contact's business cards are printed in. Presto! BizCard converts business cards into a searchable and editable database. The information can be effortlessly exchanged between computers, laptops, PDAs, and PIMs. You can also “one-click synchronize” your contacts with ACT!, Lotus Notes, Microsoft Outlook, Salesforce, or Google Contacts as well as exporting to vCard, CSV format, MobileMe, Gmail, or Hotmail. Presto! BizCard has a simple and intuitive workspace. You can sort contacts by company group, category, name (first or last), or other field. The multilingual character display lets you manage your global contacts on one screen. Browse mode gives a quick view of the front, back, and notes for each card, and the Smart Search feature retrieves contacts almost instantly. Presto! BizCard sports a new Scan to Outlook feature. The BizCard add-in can be accessed from Microsoft Outlook and all the scanned business cards will be directly transferred to the designated contacts folder with card images attached. In addition, you can scan your business cards without having BizCard or Outlook application open. Just scan business cards with the BizCard Tool from the System Tray. Each contact with its card image will be seamlessly transferred to both BizCard and Outlook. Presto! BizCard includes a full-featured printing utility that allows you to print the contact data onto address labels, nametags, ID badges and more. - It supports various formats including Avery standard label stickers and also includes ready-to-use templates. The System Tray BizCard Tool provides quick scan, capture, and transfer of data without starting BizCard. Optional recognition for both sides of business card. The recognition language can be specified. 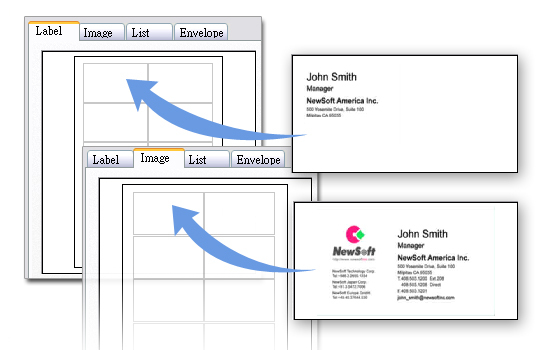 NewSoft SFIT (Smart Field Identification Technology) sorts card data into fields of first name, last name, address, and so on. Newly designed user interface provides a clean and simple workspace. A smart search feature retrieves contacts almost instantly. Organize contacts by company groups, sort by first or last name, or by other fields. Browse mode gives a quick view to the front, back, and notes on each card. 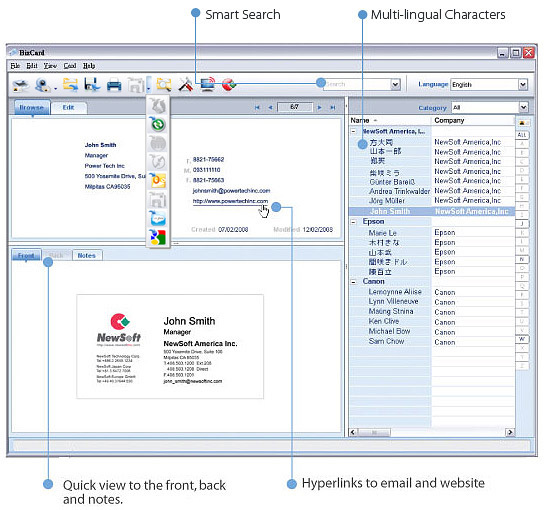 Display multilingual characters and manage your international contacts on the same screen. Supports 12 languages: English, German, French, Italian, Spanish, Portuguese, Dutch, Russian, Polish, Chinese-Simplified, Chinese-Traditional, and Japanese. Creates hyperlinks to e-mail, website, and Google Map from the contact address. Assign Categories to each contact. A printing utility prints labels, badges, envelopes, spreadsheets, business card images, and more. Background processing allows continuous scanning of cards without interruptions. Exchange contacts with your PDA or PIM and transfer contacts for cloud computer connections. Transfer contacts to Salesforce and Google Contacts. Backup the business card information to MobileMe, Gmail, or Hotmail. "One-click" synchronization with Microsoft Outlook, Microsoft Outlook Express, Act!, Lotus Notes, Palm Computing platform, and Windows Mobile devices. Export contact data in CSV format to access a wider range of applications for data exchange. A Minimum of 270 MB free hard disk space for installing the program. An additional 250 MB for running the program. 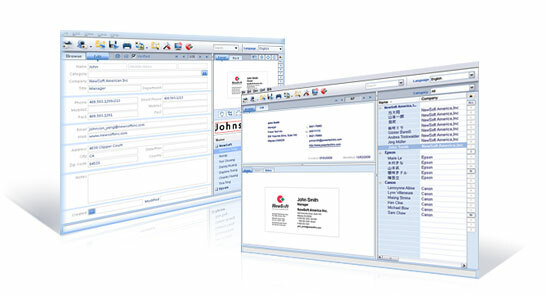 (Optional) A contact manager or personal information manager like Microsoft Outlook or ACT! For BizCard to recognize and display Eastern languages correctly, you may be required to install the associated language package. Please refer to the Regional and Language Options setting of your Windows Control Panel.